I’m over here just trying to hone my seafood skills…it’s always so easy to just order out in restaurants, but I hate to make it at home. Don’t ask me why. If you’re a bit seafood adverse in your home kitchen, like me, this is just the recipe for you. 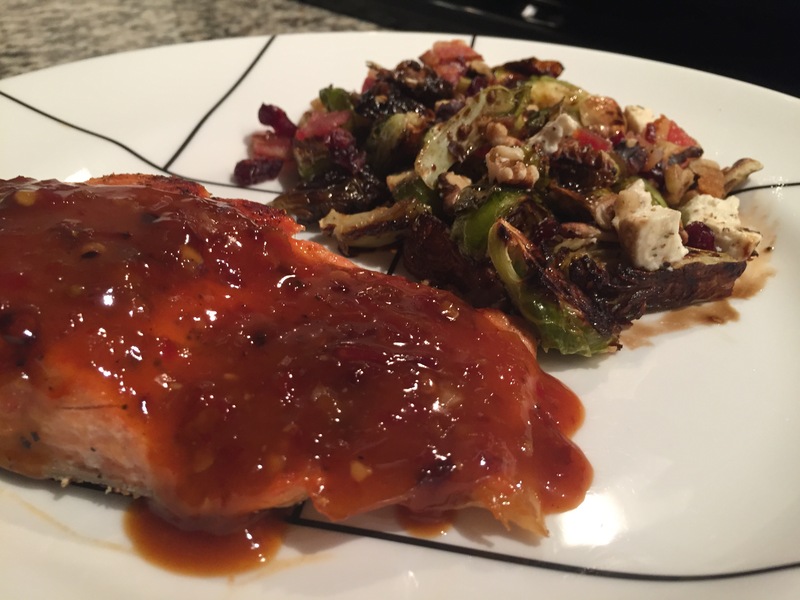 Chrissy Teigan claims she’s a little sick of salmon, but this is THE salmon. She’s right, this is the recipe that’s just perfect, and oh-so-easy for peeps who are just tired of fishing too hard. If you have friends who like a flavor punch, this tastes more impressive than it is to make. Plus, you get to sound impressive, touting a new ingredient you may have never heard of. Sambal Oelek. Is he an NBA player or a Thai sauce? I’ll never tell. 2 T. large grain mustard – (I used Dijon, it’s all I had and it was just fine). Preheat the broiler to high and move rack 4-6 inches from heat. In a small bowl combine the sweet chili sauce, sambal oelek, and mustard. Pour the mixture into a cast iron skillet. Set the skillet over medium-high heat until it begins to bubble. 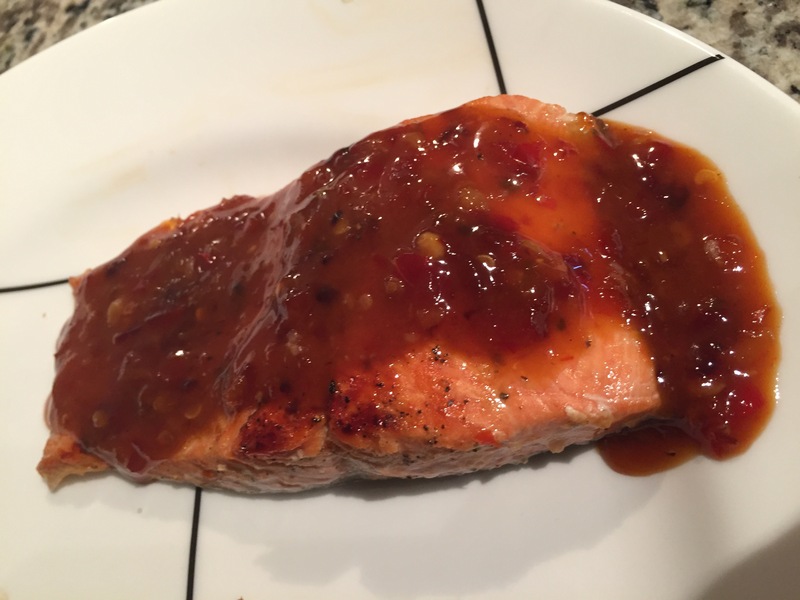 Lay the salmon, skin-side up, in the sauce. Cook about 2 minutes. Move the whole skillet to the oven and broil until the skin crisps, 3-4 minutes. Salmon should be medium-rare. Remove salmon from oven and plate the fish. Return skillet to stove and add 1/4 cup of water, cooking over high heat, stirring and scraping until sauce thickens. Pour sauce over fish and serve.